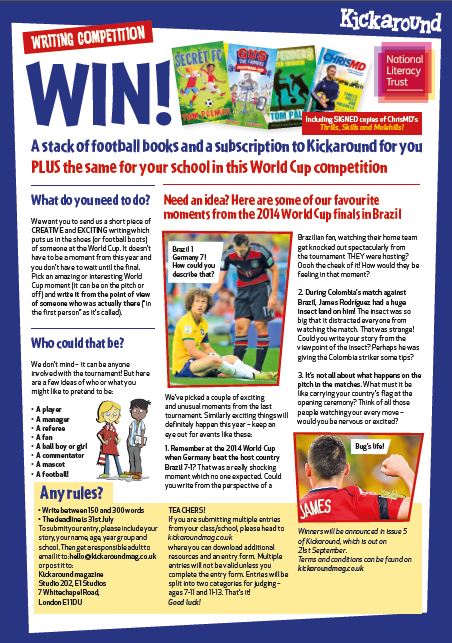 The World Cup is underway and this football competition can provide a real stimulus for getting children reading. Children’s author Tom Palmer has teamed up with the National Literacy Trust to provide football related reading resources for teachers and parents to use. He is writing one chapter of a thriller adventure every evening, while the World Cup is taking place, and publishing it on the National Literacy Trust’s website the following morning at 7.30am. Teachers or parents can then read the story aloud in the classroom or at home. By writing a chapter every evening, the story refers to what has happened in the matches played the previous day – for example chapter 2 talks about Russia’s 5-0 defeat of Saudi Arabia in the opening match of the tournament. Children are also given the opportunity to vote on what they think should happen next in the story. Download the first 2 chapters and follow the story here . There are also plenty of football reading resources available on Tom Palmer’s website. The National Literacy Trust have also teamed up with Kickaround magazine to run a football related writing competition for children. Entries should be between 150 and 300 words and written from the point of view of somebody at the World Cup. The closing date for entries is the 31st of July and there are lots of football books to be won! Curriculum experts at Peters have also published some guided reading notes for a range of football and Russia themed books from EYFS to Year 6 on their website. Finally, we have our own “Books for the World Cup” booklist, to highlight football resources that can be used in the classroom while the tournament is underway. May the best team win and happy reading! Posted on June 15, 2018 by Laura Brett. This entry was posted in Book news and events and tagged Football, Primary, Soccer. Bookmark the permalink.